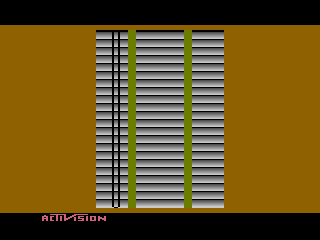 As the name implies the Venetian Blinds demo isn't a game, but a short program that simulates a pair of Venetian blinds! The joystick can be used to raise and lower the blinds by pushing up or down. When the blinds are raised a nicely done sunset is visible out the window. The story behind the Venetian Blind demo is rather interesting. As most people know, Activision was founded by several ex-Atari employees who had left due to Atari's policies on programmer recognition (or the lack thereof). This had really struck a nerve since they were responsible for over half of Atari's game sales at the time. One of these employees was Bob Whitehead, creator of the "Venetian Blinds" technique, which was first used in Atari's Video Chess to display eight objects in a row instead of the normal six (see Computer Chess for more information). 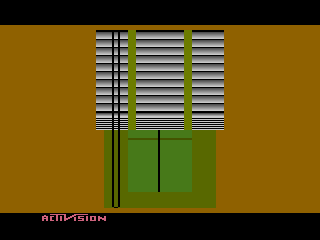 Even though Activision had never used the Venetian Blinds technique in any of their games up to this point, that didn't stop Atari from threatening to sue Activision for "stealing" the technique along with other various bits of proprietary information. Atari knew they probably couldn't win the lawsuit given that Activision wasn't even using the technique in question, but what they were hoping for was that they could either scare Activision into getting out of the games business or scare away people from doing business with them. Now Activision knew that they hadn't stolen anything from Atari, but the accusation had caused a hit to the morale around the office. So as a way to cheer everyone up, David and Bob decided to create an elaborate practical joke. 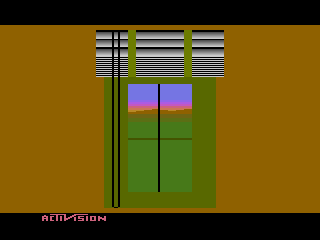 They created a small demo which displayed a window with a beautiful sunset in the background (this would later become a standard feature of many Acitvision games). Covering this window was, you guessed it, a set of venetian blinds. The player could use the joystick to raise and lower the blinds at will until they grew bored. Not much of a demo, but still rather snarky and hilarious given the circumstances Activision found themselves in. According to David Crane, they took the demo to the CES and showed it to a few people who had knowledge of the lawsuit (it was not on public display) asking people "Is this what Atari means by the Venetian Blind Technique?". In the end the lawsuit never happened, it is thought that Atari and Activision settled out of court but the details are still not known to this day. What we do know is that Activision and Atari came to some sort of agreement which opened up the flood gates to other third party companies to being making their own 2600 games. Once the dust had all settled the Venetian Blinds demo was quickly forgotten about until it surfaced as a bonus freebie on the Activision Anthology. This marked the first time the demo had been seen by the general public (or by anyone since 1982). Note: It had been previously reported that the Venetian Blinds demo had been created for the purpose of taunting Atari's lawyers ("When the Atari's lawyers questioned them about the 'stolen' Venetian Blinds technique David showed them this demo and said "Is this what you guys are referring to?""). This has since been proven to be incorrect by none other than David Crane himself who set the record straight. The management wishes everyone to know that the writer of the previous version of this article has been sacked.